The second Kathleen Whyte Memorial Lecture was given by Jan Miller. Jan has taught and exhibited widely and is a member of the Costume and Textile Association for Norfolk Museums, Embroiderers’ Guild, Practical Study Group and 62 Group. Jan Miller’s textile art constructs a narrative to make visible the human contribution in a work process. 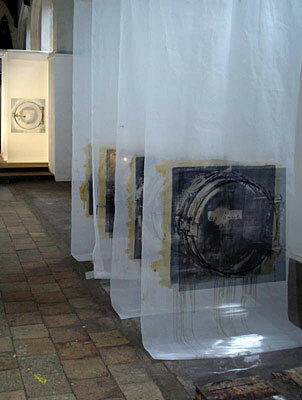 Hidden elements of industrial and/or repetitive work are uncovered – collected, analysed, catalogued and re-presented. Whilst her MA studies focussed on laundry collections, recent work has examined the layers of evidence left by seamstresses and wearer(s) in garments to reveal a history between maker and consumer, process and product. Her own experience and practice is interwoven within the analysis of the marks of the making process overlaid with wear, alterations and repairs. A new narrative is presented of the overlooked labour of the everyday and unknown workers who leave behind unremarked traces of their lives. The lecture took place on Saturday 5 November 2005 at 2pm in Verdant Works, Dundee.